Summer science at its finest! 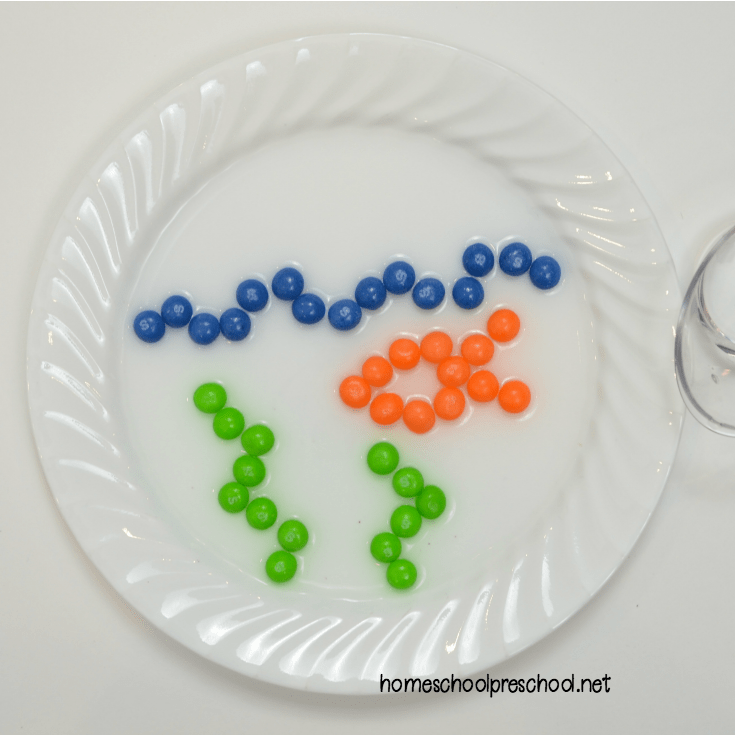 You don’t want to miss this ocean-themed Skittles candy science experiment. Your kids will beg to do it again and again. 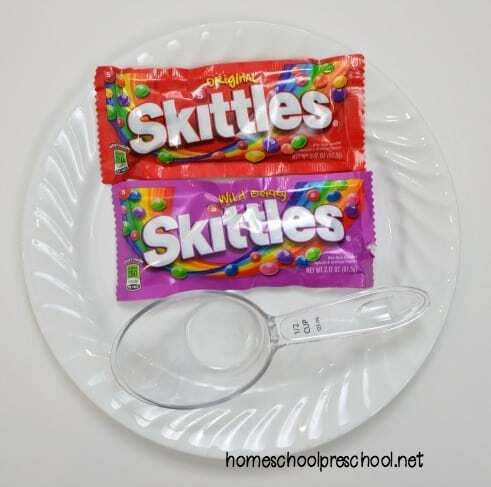 I’ve done the Skittles science experiment before for St. Patrick’s Day, and the kids love it. They’re fascinated by the emerging rainbow. 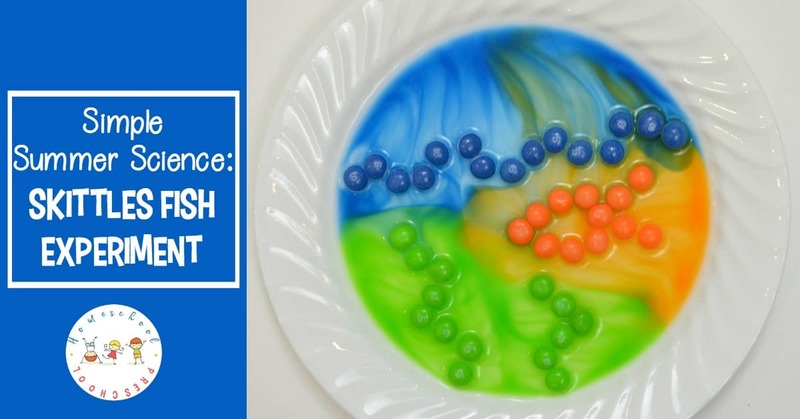 For summer, however, you need to try this ocean-themed Skittles candy science experiment. Your kids will beg to do it again and again. Prepare some warm water in a mug or measuring cup. You’ll need about 1/2 cup to complete the experiment. The warmer the water, the faster the colors will melt from the Skittles. 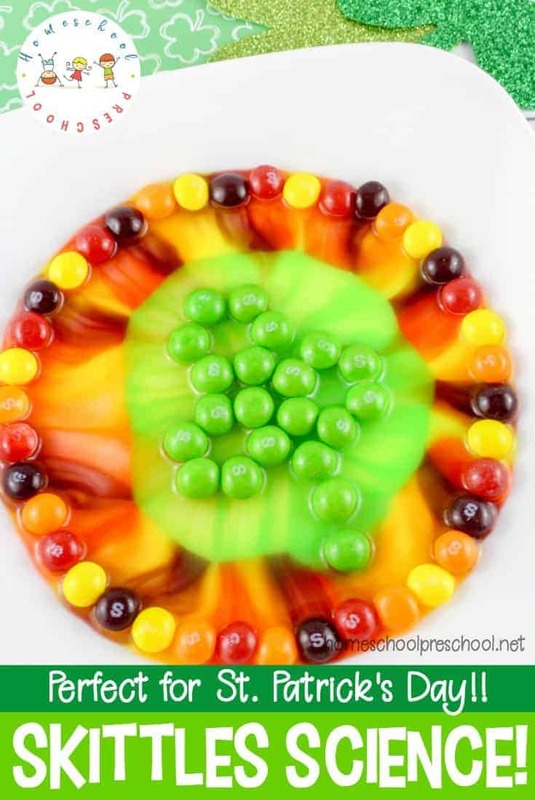 Next, open the Skittles and arrange them in a fish scene pattern. To do this, create a zig zag pattern at the top to mimic ocean waves. Add vertical zig zags from the bottom to make sea weed. 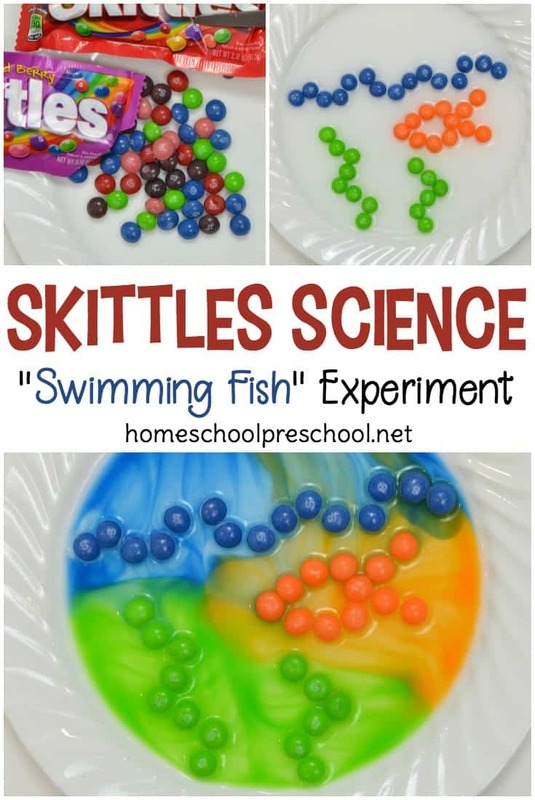 Finally, add orange Skittles to make a gold fish. Now, you’re ready for the actual experiment. To keep the ocean scene in tact, pour the water gently on the plate. Pour from the side. Avoid pouring it directly on the Skittles themselves. Sit back, and watch the colors melt away from the candy. 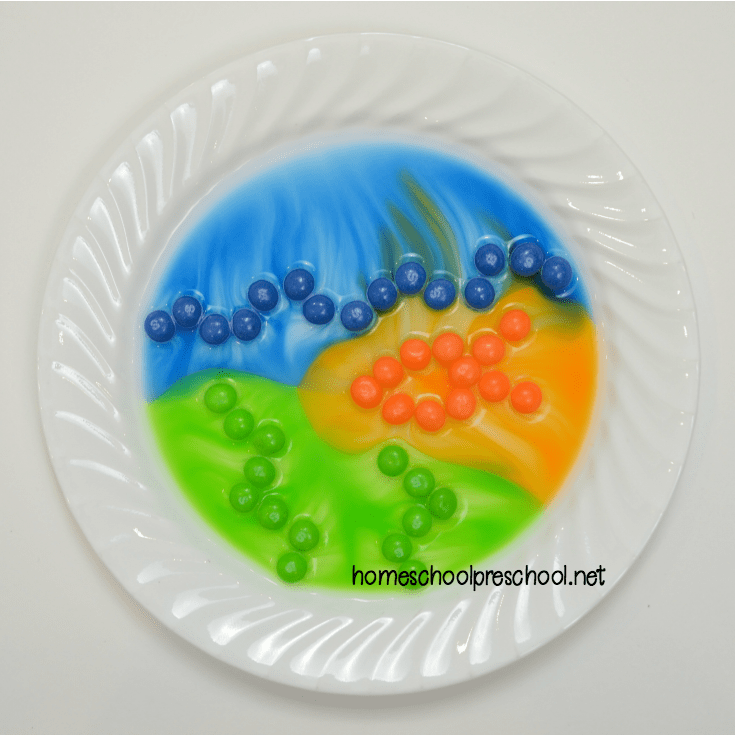 You and your preschoolers will see a cool underwater scene emerge! This experiment is so easy that your kids will beg to do it again and again. Because it’s virtually mess-free, you’ll say yes! 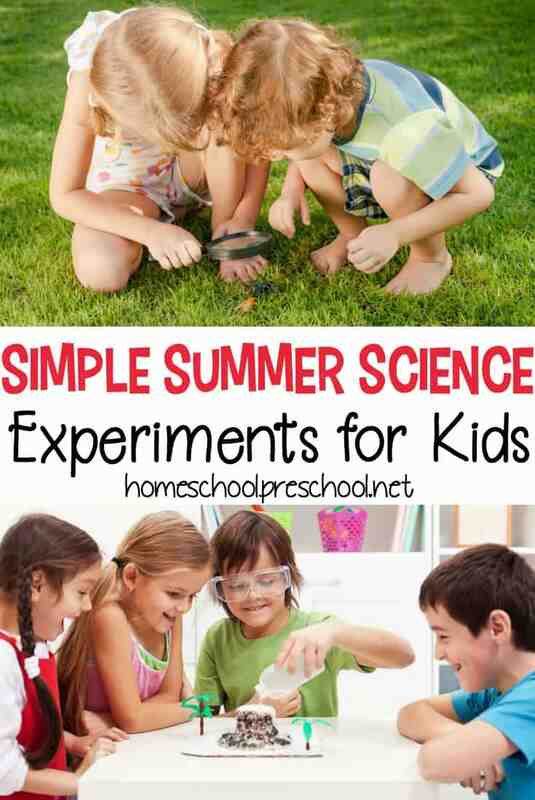 If you’re looking for more kitchen science experiments to do with your kids this summer, take a look at these ideas. • Kitchen Science Lab for Kids – Cook up some science in your home with Kitchen Science Lab for Kids. Do physics, chemistry, and biology experiments with tools and ingredients found in any kitchen! • Exploring Kitchen Science: 30+ Edible Experiments and Kitchen Activities – Did you know that your kitchen is actually a secret laboratory where tons of crazy-cool science goes down every day? Or that your fridge is jam-packed with chemistry materials? Join the world-famous Exploratorium for 30+ delicious discoveries, including the science of food, cooking, baking, nutrition, and taste. 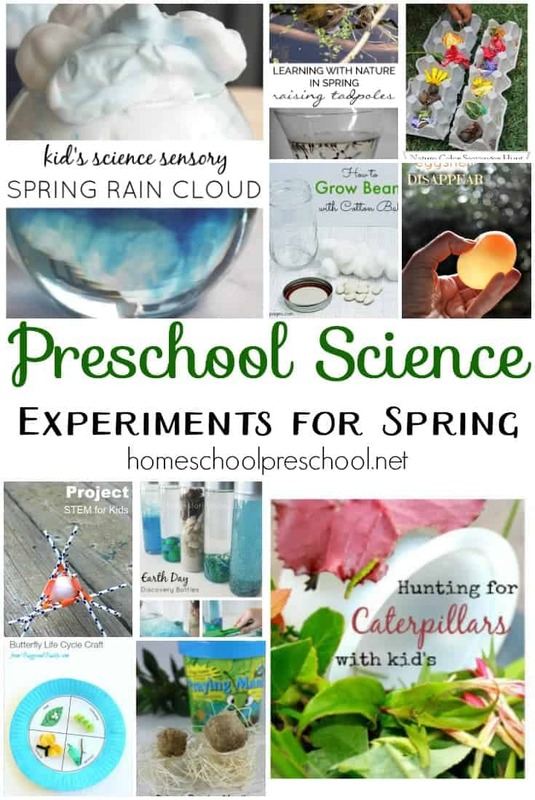 • STEAM Lab for Kids: 52 Creative Hands-On Projects – STEAM Lab for Kids is an art-forward doorway to science, math, technology and engineering.